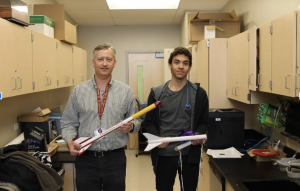 The Laramie High School WyoSpace club, a 3 member rocketry club, is set to compete in the 2019 Team America Rocketry Challenge (TARC). TARC is a competition that is celebrating the 50th anniversary of Apollo 11. The WyoSpace club is advised by Paul Fechtmeister, a Physics teacher at Laramie High School (LHS) who has taught for 12 years and is currently teaching his first year at LHS. The club/team is made up of solely underclassmen. The team captain is sophomore Christian Muntzer. “He [Christian] would like to get this club and group of today’s kids interested in space, science, technology, engineering and math (STEM),” according to the WyoSpace club grant letter. The club is managed by sophomore Gage Vandiver, who is the lead fundraiser. Their final member is freshman Thomas Crawford. In celebration of the 50th anniversary of the Apollo 11, the first spaceflight to land on the moon, the TARC competition modified its rules this year to honor the event. For the three members, the TARC competition will be their first experience with competitive rocketry. As the advisor, Fechtmeister provides experience for this team. He is a National Association of Rocketry member and shows the team the exact methods used when attempting to qualify for Washington D.C.
“For me it’s a passion, I have a passion for this too much, like I’m obsessed about this, but I’m hoping they’ll get it,” Fechtmeister said. Fechtmeister also has experience advising a TARC team when he was a teacher at Cheyenne East High School (East). He advised a team that was top 100 in the country and qualified for Washington D.C., eventually placing 77th at the competition. The East team’s qualification caught the eye of US Senator Mike Enzi. Senator Enzi built rockets in the 50s and 60s and was a judge for the Washington D.C. qualifier for TARC. “When we qualified in 2012 [Enzi] was surprised, he was like I have never had a team from Wyoming qualify,” Fechtmeister said. The WyoSpace club is currently following the recommended schedule of activities for the competition. The team is on week 6 and is bringing together design ideas for their TARC entry. “We plan on…having three designs made so we all can come together and see what works, what does not, and all make a final design,” Vandiver said. The WyoSpace club needs to fundraise up to $4,000 if the team places top 100 and travel to Washington D.C. The team’s short term goal is to fundraise $1,000 and test the rocket that the team plans on putting together. The team has received $500 from the Wyoming NASA Space Grant Consortium, which also helped the team from East. They plan on making around $900 through concessions at LHS events.